There are 76 miles of intact, functioning levees and 17 miles of breached levees in the project area; 138 tide-gated culverts pass through these levees. 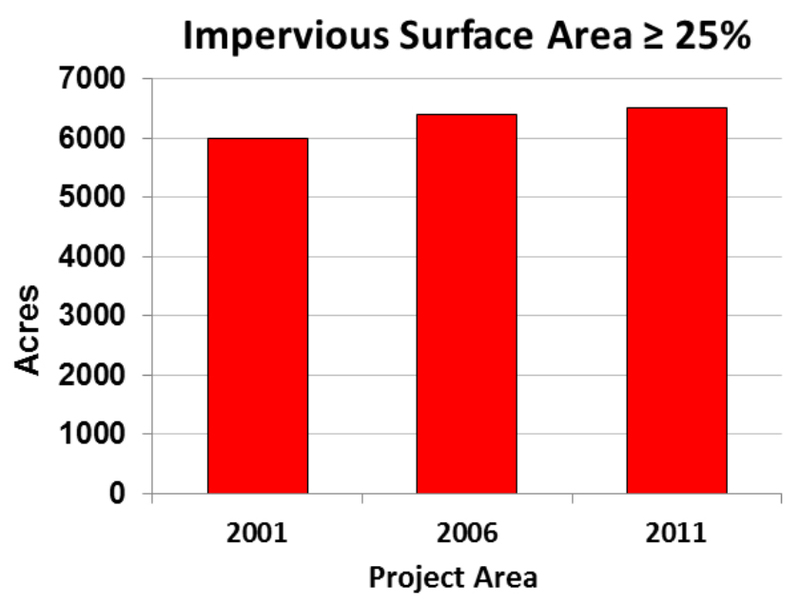 Total impervious surface area has steadily increased in the project area since 2001. The subsystem with the greatest impervious surface percentage is Pony Slough. Road densities in all subsystems far exceed commonly accepted criteria for healthy watersheds. Location of major human infrastructure in the project area including levees, tide gates, roads, impervious surfaces, and stormwater outfalls, and their associated data sources. Also shown are tax lots where levees and tide gates either currently exclude, or historically excluded tidal flooding. 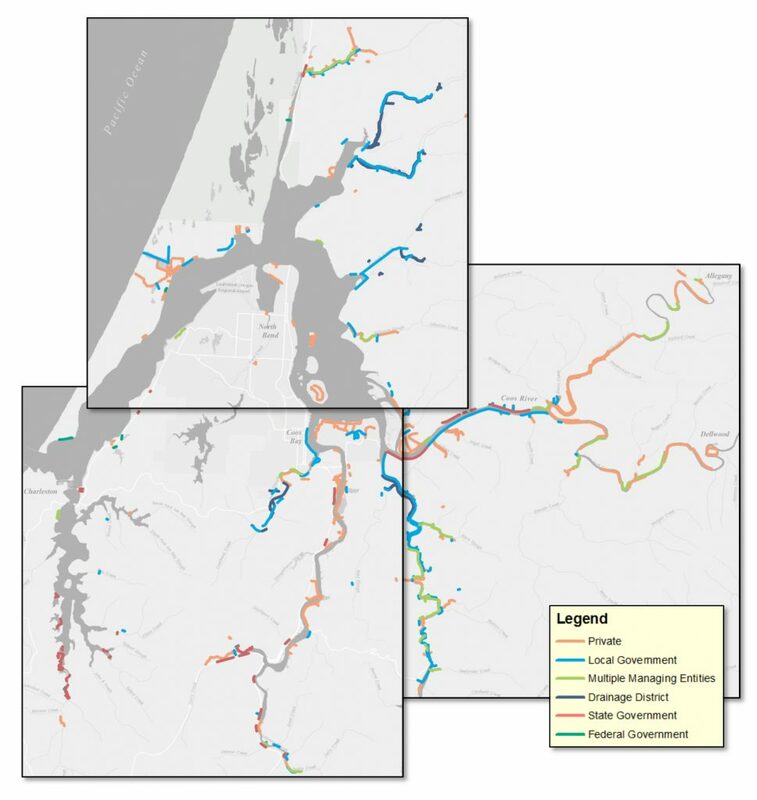 In the following data summary we provide the most current information describing the following types of human infrastructure in the project area: levees and tide gates, impervious surfaces, roads, and those lands (mapped as tax lots) where levees and tide gates either currently exclude, or historically excluded tidal flooding. As a sea level rise strategic planning tool, the Oregon Coastal Management Program (OCMP 2011a-c) created a geospatial database for coastal managers that allows anyone to map the locations of levees and tide gates in Oregon estuaries. The database was created using existing aerial photography and LiDAR land contour and elevation data. With this tool, coastal managers can identify flood-protected lands threatened by excessive storm tides and target levees in need of repair, or those that willing landowners can breach or remove to re-establish valuable tidal wetlands. For the purposes of this assessment, these OCMP levee data were divided into four main categories to determine the condition of project area levees: 1) functioning levees; 2) breached levees; 3) historically present but removed levees; and 4) side-cast dredge material that functions like a levee (Figure 1). Using these categories, we found over 76 miles of functioning levees in the project area, and over 17 miles of breached levees which no longer function as intended (Figure 2). We analyzed each of the OCMP levee data categories by levee land owner (Figures 3 and 4). Over 50 miles (or over 65%) of levees are managed by private entities in the project area (this includes residential and commercial land owners). Local government land owners manage the next highest number of levees (nearly 28 miles). Private land owners manage the most levee types. Private land owners manage the most levees in each category. Of all levees managed by local government land owners, 91% are functioning levees. This is also the highest percent of functioning levees in a single land owner group. 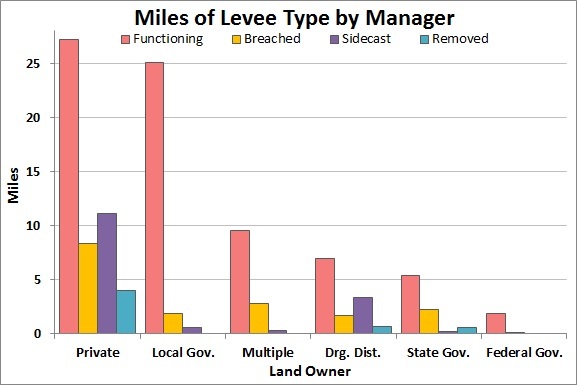 State government, by contrast, manage the greatest percentage of breached levees (26%) as a percentage of all state-managed levees in the project area. The greatest number of miles of levee removed (over four miles) has occurred on private lands; this is the highest percent of removed levees by a single owner group (8%). Drainage districts managed more sidecast-type levees as a percentage of their holdings than any other managing entity. Figure 2. 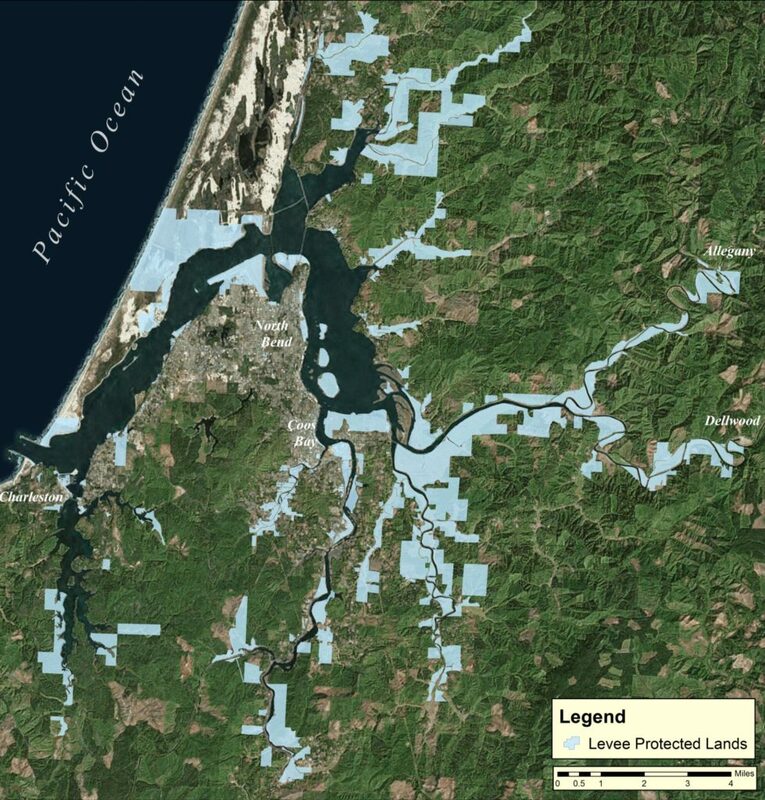 Total miles of levee as identified by the Oregon Coastal Management Programs levee inventory. Functioning levees include manmade and natural levees. Data source: OCMP 2011a. Levee – An elevated embankment that provides protection to land behind it from flooding by rivers or tidally influenced channels. 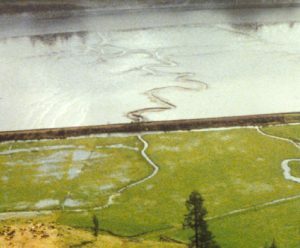 Levees can be natural or artificial and made from a variety of materials, although they are most commonly earthen structures. The term “dike” is commonly used interchangeably with “levee”. Sidecast – The practice of piling soil on the side of the bank while dredging or excavating a drainage ditch. 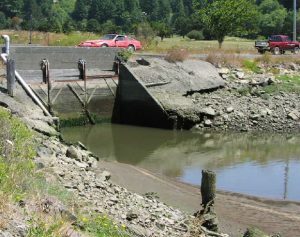 Tide gate – A culvert or opening placed into a levee with a hinged flap on the downstream end that allows freshwater to flow into the estuary, but prevents brackish water from flooding land behind the levee. Figure 5. Lands (based on tax lots) that are currently or were historically protected by levees. Data source: OCMP 2011b. Figure 3. 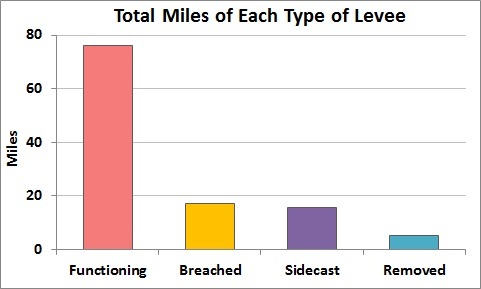 Total miles of each category of levee by land manager. Private managers include residential and commercial owners. “Drg. Dist” stands for drainage district. Data source: OCMP 2011a. Impervious surfaces are the paved surfaces and structures that prevent the natural infiltration of precipitation into soils. By preventing soils from absorbing precipitation during storms, impervious surfaces can indirectly create large volumes of surface runoff that have the potential to adversely affect natural habitats and human development (e.g., delivering sediment to salmon spawning gravels, eroding developed shorelines)(USEPA 2014; NOAA 2010; Flinker and Millar 2010). The United States Environmental Protection Agency (USEPA) has established an impervious surface threshold range of 4-6% of the total watershed area beyond which they estimate water quality degradation and impairments to aquatic biota can begin to become apparent (USEPA 2014). Others have established commonly used impervious surface thresholds to describe the degree of risk to stream health. Impairment to stream water quality becomes evident when 1-10% of the watershed is covered with impervious surfaces; and impairment to stream water quality becomes severe when the watershed is covered with greater than 25% impervious surfaces (NHEP 2007; Flinker and Millar 2010; citations within Exum et al. 2005; Schueler 2003). In this section, we will refer to these thresholds as the moderate and severe thresholds, respectively. According to the National Oceanic and Atmospheric Administration (NOAA 2010), impervious surfaces cover about 0.5% of Coos County, and about 0.68% of the Coos watershed as a whole, both well below the impervious surface thresholds described above. The National Land Cover Dataset (NLCD), provided by the Multi-Resolution Land Characteristics Consortium, began to include impervious surface data in 2001, and is updated every five years (MRLC 2015). A comparison between project area subsystems using the NLCD spatial data indicates that Pony Slough has the greatest percentage of impervious surface coverage with 43% of the Pony Slough subsystem area above the moderate threshold, and 33% exceeding the severe threshold (Figures 7 and 8). Significant impervious surface area above the moderate threshold exist in the Lower Bay (13%), Isthmus Slough (11%), North Slough (7%), Upper Bay (6%), and South Slough (3%) subsystems. 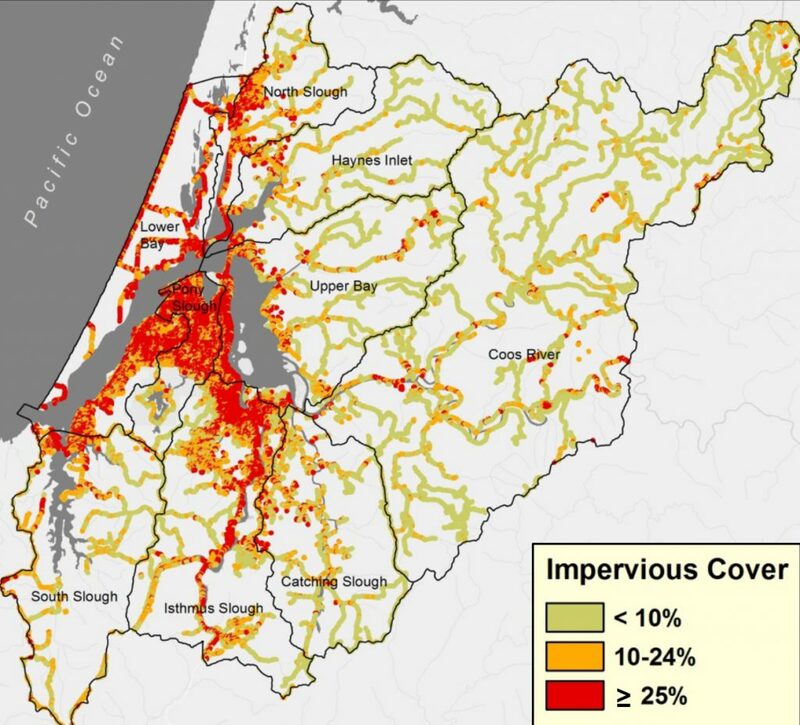 Impervious surfaces above the moderate threshold comprise less than 2% of the area in the Catching Slough, Haynes Inlet, and Coos River subsystems. Between 2001 and 2011, total impervious cover above the severe threshold increased slightly in all subsystems and in the project area as a whole (Figures 8 and 9). The growth rate in impervious surface area was generally faster in the period between 2001 and 2006 than between 2006 to 2011, with the highest total acreage, and the most rapid increase, occurring in Pony Slough. 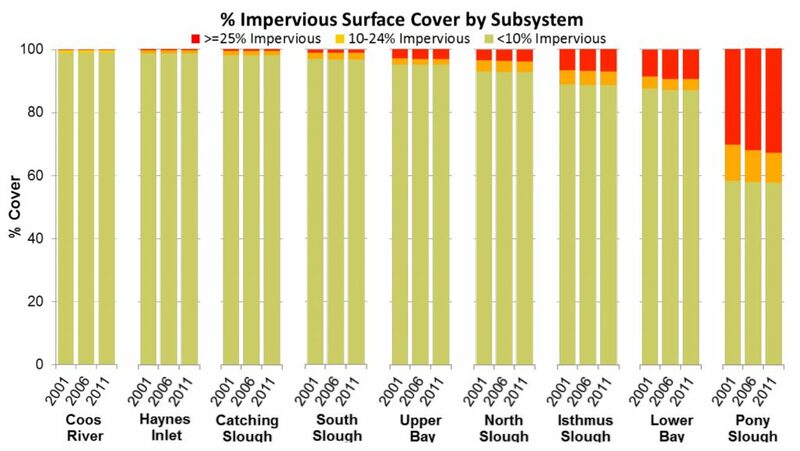 The smallest changes to impervious surface cover occurred in Haynes Inlet, Catching Slough, Coos River and South Slough. Over the decade for which data are available (2001-11), more than 500 acres (0.8 mi2) of impervious cover were added to the severe (≥25%) category in the project area, totaling 6,500 acres (10 mi2) by 2011 (Figure 9). Figure 10. Outfall locations within Coos Bay and North Bend city limits. Data: City of Coos Bay n.d.; City of North Bend 2005. Like impervious surface area, road density is a measure used to evaluate the environmental conditions in a watershed. While roads obviously provide critical support to a wide variety of human activities, they do affect the same natural systems upon which coastal communities and their economies rely. Too many roads, for example, will affect the movement of wildlife, fracture wildlife populations, and disrupt hydrological networks and natural fire regimes (Forman and Hersperger 1996). They have also historically degraded or eliminated tidal and non-tidal wetlands and fish-bearing streams (Forman and Hersperger 1996). Watersheds with road densities higher than 1 mi/mi2 (0.6 km/km2) are considered at great risk of water quality and wildlife population degradation (Carnefix and Frissell 2009; Forman and Alexander 1998). Densities of roughly 4 mi/mi2 (2.5 km/km2) have been correlated with drastic increases to peak stream flows (Forman and Alexander 1998). While these estimated thresholds may be useful for understanding the general effects of too many roads in a watershed, they do not take into account road width, pavement type, traffic density or road network connectivity (Forman and Alexander 1998). Forman and Alexander (1998) suggest the structure of road networks is an important consideration; large areas with very low road density adjacent to high road density areas provide the least ecological damage, compared with more evenly distributed road networks that cause more widespread habitat fragmentation. The Oregon Department of Transportation (ODOT) regularly compiles statewide data from multiple sources to create a comprehensive road data set. Their most current data (ODOT 2014) indicate 1,429 miles of road in the project area (includes all road types – e.g., forest roads, urban streets). This represents a road density of over 4.5 mi/mi2 (2.8 km/km2) in the project area, far above the estimated thresholds suggested by Carnefix and Frissell (2009) and Forman and Alexander (1998)(Figure 11). Although the ODOT road density data are the most accurate estimate available for the project area, they likely under-represent current conditions as new roads (especially forest roads) have been created since those data were compiled. Originally built starting in the 1800’s to extend and protect agricultural, urban and residential lands in coastal Oregon, many levees are now in danger of being over-topped during winter storm tides, which are expected to cause more flooding as sea levels rise. Just as important, the area of remaining tidal wetlands (critical nursery habitat for many recreational and commercial aquatic life such as Dungeness crab) may be in danger of declining as levees prevent inland migration of those wetlands in response to sea level rise. Good (2000) estimates that over 65% of Coos estuary tidal wetlands were converted from tidal wetland habitat to agriculture, urban, and residential uses between 1870 and 1970. Miles of levees and hundreds of tide gates were constructed to maintain those lands in their converted states. Since 1970, some of the tidal wetland losses have been reversed when willing landowners have removed levees to restore lands to their original tidal wetland functions (Good 2000). Tide gated culverts eliminate tidal flooding while allowing creeks to continue emptying into the estuary during low tide. Water flow is controlled by tide gates fitted with hinged doors on the culvert’s downstream end (outside the levee on the estuary side). Passively regulated by difference in water levels on either side of the levee, tide gated culverts allow water to flow into the estuary but not back into the protected lands (Bass 2010). For estuarine-dependent and anadromous fish species, tide gates often pose nearly impassable barriers during high tides each day, restricting access to habitat and altering migratory timing (Bass 2010). For example, sub-yearling Coho salmon may be unable to cross between upstream and downstream habitats since tide gates create high water velocities and outlet waterfalls while the tide gate is open that can often prove dangerous or impassable in both directions for small fish (Bass 2010). Additionally, tide gates can be detrimental to downstream migrating juvenile salmon that abruptly experience high estuarine salinities as they move through the tide gate, instead of being allowed to acclimate to gradually increasing salinities as they are in natural systems. Furthermore, disconnecting upstream aquatic habitats from the estuary alters their natural temperature and salinity regimens. Giannico and Souder (2004) discuss how estuarine wetland soil salinities change, effecting soil pH and its capacity to sequester heavy pollutants (e.g., lead, copper, cadmium). This sequestration is important, as the pollutants remain relatively harmless when chemically bound to wetland soils (Giannico and Souder 2004). Newer tide gate designs are fitted with side-hinged openings designed to open wider to reduce turbulence and water velocity, and stay open longer to allow brackish water to circulate above the gate and reduce the abrupt transition between the salty and fresh sides of the gate. (Giannico and Souder 2004). Negative effects of impervious surfaces (e.g., increased stormwater runoff volume, velocity, and peak flow; reduced groundwater availability; increased channel erosion; impairments to biota; and increased sediments, nutrients, and pollutants) can appear in watersheds with as little as 4-6% impervious surface coverage (USEPA 2014; NOAA 2010). 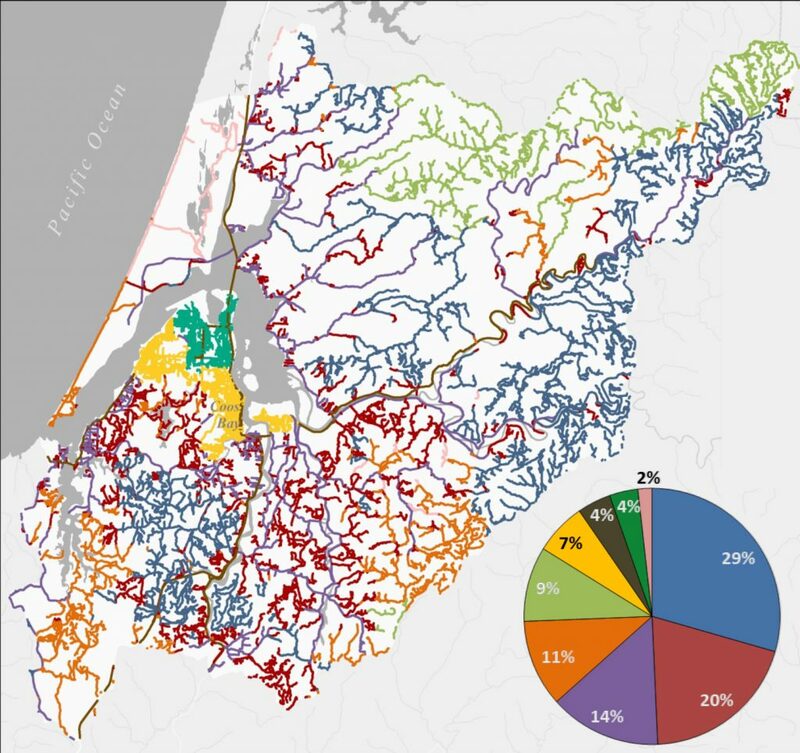 A New Hampshire Estuaries Project (NHEP) fact sheet summarizes several effects of impervious surface coverage in watersheds, such as the alteration of natural water flow, elevated water temperatures, aquatic habitat loss, pollutant delivery, and loss of biologic diversity (NHEP 2007). Ordinances controlling urban development and managing stormwater runoff are among the socio-economic issues associated with managing the effects of impervious surface coverage. For example, a community wishing to protect local streams from the potentially overwhelming effects of urban stormwater run-off could regulate the density and placement of new housing developments using a USEPA-designed approach (USEPA 2006). 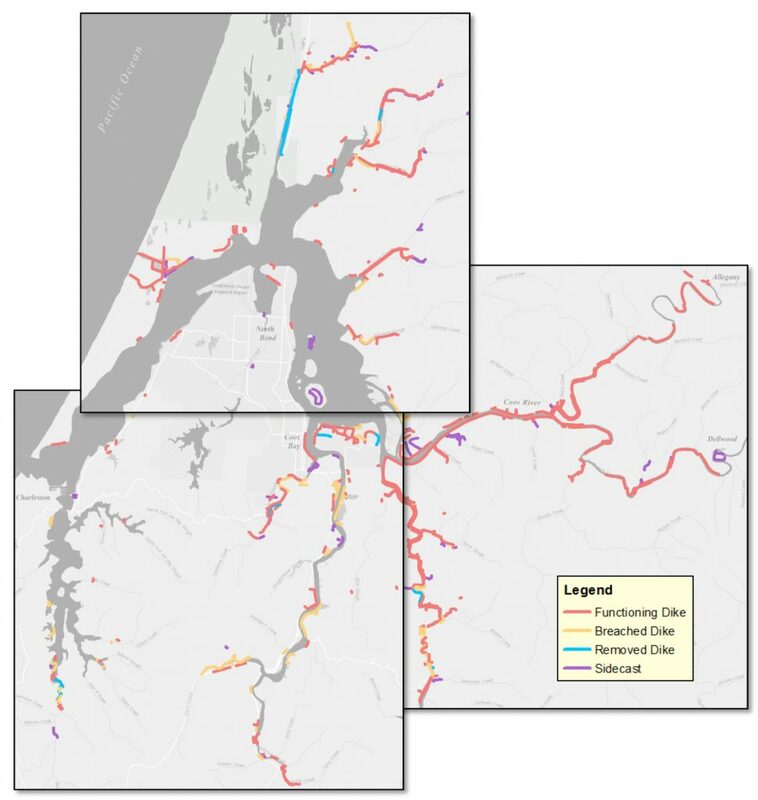 OCMP (2011b) provides coarse-scale spatial data which can be used to highlight lands in the project area excluded from tidal flooding by levees (currently or historically)(Figure 5). Based on tax assessor parcels, these data include any lands clearly being protected by a levee or immediately adjacent to a levee. Because not all the land in these adjacent parcels is/was protected by the levee, these data are an overestimation of the levee-influenced lands. Using these data, we calculate that the project area includes over 17,300 acres (27 mi2) of land parcels, some portion of which are or were excluded from tidal flooding by levees (Figure 5). Additionally, we mapped OCMP (2011c) tide gate locations for the project area (Figure 6). In 2009, there were 138 tide gates in the project area. Most of those were concentrated along Coos River and Catching Slough tributaries. Figure 6. 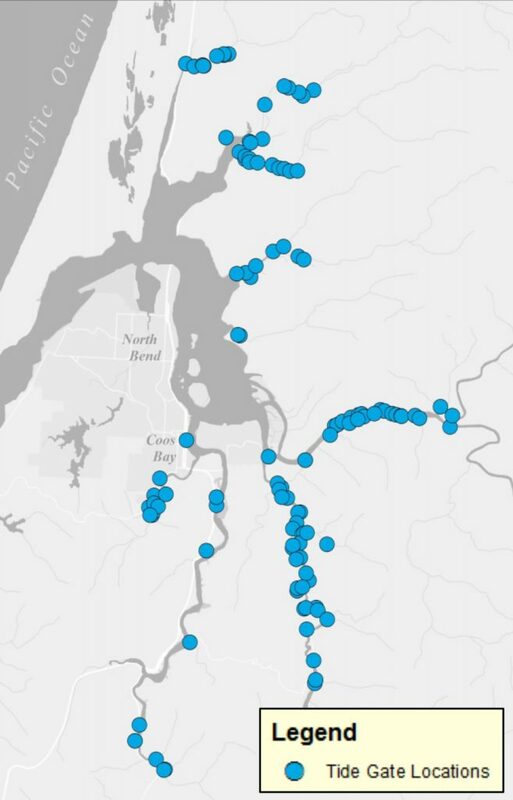 Tide gate locations in the Coos watershed identified during Oregon Coastal Management Programs levee inventory. Data source: OCMP 2011c. Areas already covered by 10-24% impervious surface (over the moderate threshold but under severe) accounted for most of those gains, rather than areas of lower impervious surface cover reaching levels of greater imperviousness. Greater growth in impervious surface area occurred between 2001-2006 compared with 2006-2011. Surface runoff and the related pollutants are positively correlated with impervious surface area. Urban runoff, often unfiltered, is commonly directed into storm drains which empty directly into the estuary, creek or other water body at specific discharge points, or outfalls. 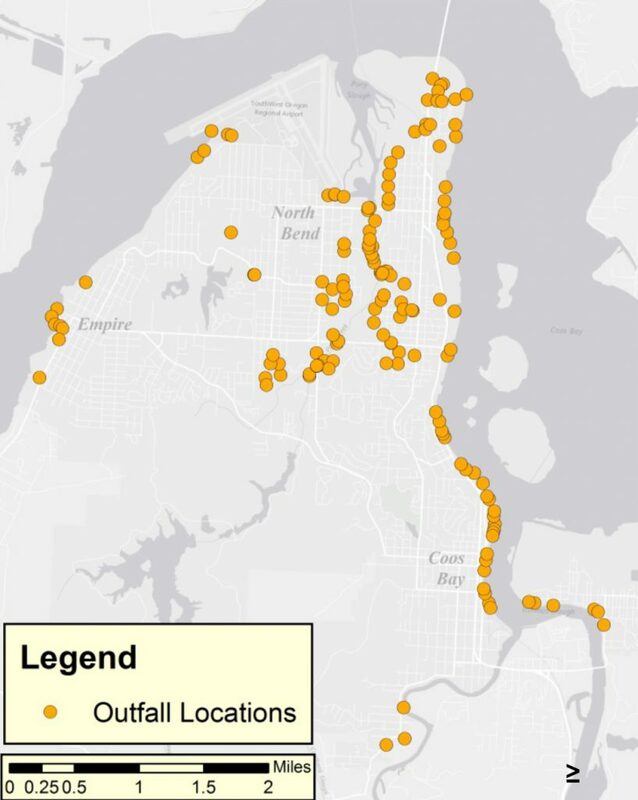 Storm drain outfall locations in the cities of North Bend and Coos Bay are mapped in Figure 10. Figure 11. Road density by subsystem and total project area. The exceedance criteria of 1 mile/mile2, above which degradation to ecological systems occurs, is shown (red line). ODOT 2014. 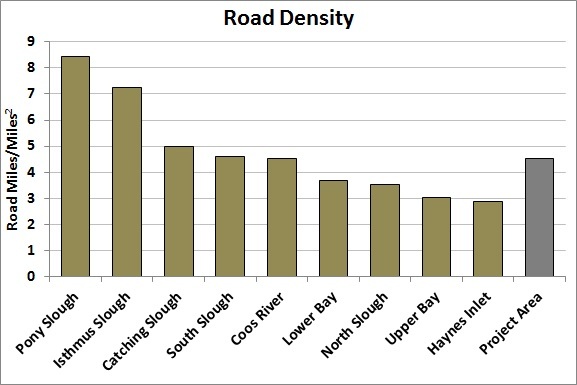 By subsystem, road densities were highest in Pony and Isthmus Sloughs (densities of 8.5 and 7.2 mi/mi2 respectively, or 5.3 and 4.5 km/km2)(Figure 11). These also happen to be subsystems with high impervious surface coverage. The Haynes Inlet subsystem shows the lowest road density at 2.9 mi/mi2. The ODOT data also provide information on road ownership, compiled from multiple sources (Figure 12). This information is limited and so we supplemented their category of unknown ownership with land ownership information (based on tax assessor maps)(it should be noted that land ownership does not always indicate who manages lands and associated roads). Lands owned by forest product companies (e.g., Weyerhauser) hold nearly 30% (414 mi) of the roads in the project area; Coos County Highway Department owns 14% (200 mi); and Oregon Department of Forestry owns 9% (135 mi). Figure 12. Roads in the project area by ownership. Inset pie chart shows percentage of roads in the project area that each entity manages. “Federal Government” groups Bureau of Land Management (BLM) and US Forest Service (USFS) managed roads. *ODOT’s “Other” category was further broken down by cross-referencing with land ownership (tax lots). “Other” now includes roads on tribal, corporate, water board, Port of Coos Bay, and private residential lands. 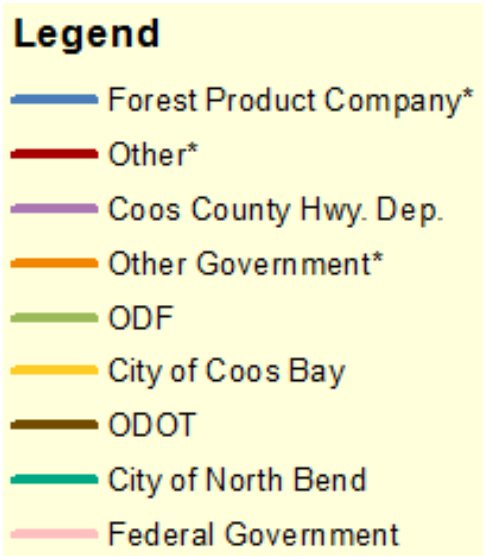 “Other Government” represents roads on lands owned by the Cities of Coos Bay and North Bend, Coos County, Oregon Department of State Lands, and federal government. “Forest Product Company” represents roads on lands owned by Menasha Forest Products, Roseburg Forest Products and Weyerhauser. Data source: ODOT 2014. Other ways to address issues associated with impervious surface coverage include the use of permeable pavements. Permeable pavements use newly developed materials that allow water to move through the pavement surfaces. This process reduces runoff and allows trapping and filtering of suspended solids and pollutants along the way. During storms, virtually all rainwater permeates and flows through these new types of pavements, instead of running off their surfaces, even after six years of heavy parking use (Brattebo and Booth 2003). Additionally, Brattebo and Booth (2003) found that waterborne pollutants (copper, zinc, lead, motor oil, diesel fuel) were nonexistent or significantly reduced after flowing through permeable pavements compared with surface runoff analyzed from a typical asphalt-covered area. Unfortunately, because permeable pavement is more expensive than regular pavement it is not yet widely used. A large percent of impervious surfaces serve automobile traffic (Brattebo and Booth 2003). Essential for transporting both people and goods, the term “roads” broadly encompasses everything from private and lower capacity roads (e.g., alley or street), to high capacity highways. Road surfaces are also highly variable and are frequently made of gravel (e.g., forest roads), asphalt, or concrete. According to Forman and Alexander (1998), roads allow human access to remote areas, sometimes with unintended consequences. For example, diseases (e.g., Port Orford cedar root rot) or invasive species expand their range past normal distribution bounds to remote areas via vehicular transport on remote roads. Forman and Alexander also raise the issue of an increase in human-caused wild fires as road density increases. However, remote fires are smaller on average in areas of higher road density, likely due to relatively easy access for fire fighters and the roads’ natural contribution to the creation and maintenance of fire breaks. A National Research Council (NRC 2005) report found that paved roads threaten the survival and reproductive success of wildlife populations. The most direct connection is direct mortality to animals (i.e., vehicle collisions), which can affect survival probability of local populations. Additionally, roads are barriers to wildlife movement. They fragment, isolate, or even extirpate some populations (especially fish). Noise from high-traffic roads can reduce breeding success of many bird species, as far as 1,500 meters (~1 mi) from the road. NRC (2005) described that when surrounding landscapes are altered by human development (i.e., agriculture, timber or residential), buffers along roadsides often act as last remaining habitats for native plant, insect, bird and small mammal species. Yet roads themselves change the native composition of plant/animal communities, as these species need to be able to cope with vehicular pollution, high sunlight exposure, dry and sometimes dusty soils and chemical spraying or mowing maintenance. In addition, NRC (2005) described effects of road-related pollution. Pollution from roads can reduce wetland biodiversity as far as 2 km (~1.2 mi) away. Road-related pollution can poison wildlife, such as birds, mammals and amphibians. Pollutants generated from vehicles, such as lead, copper, and zinc, accumulates on impervious roads, entering waterways during rain events. Other pollutants come from road maintenance activities (e.g., road salt, herbicide spraying), and have similarly damaging effects to aquatic systems, vegetation and wildlife. Figure 1. 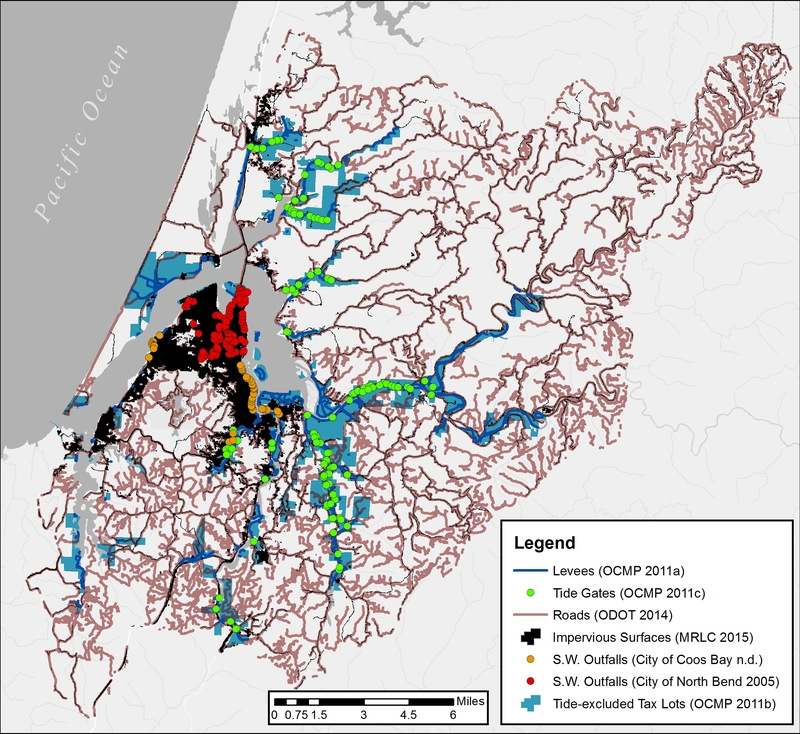 Location and status of levees as identified by the Oregon Coastal Management Programs levee inventory. Functioning levees include man-made and natural levees. Data source: OCMP 2011a. Figure 4. Locations of levees by managing entity. Levees shown include functioning and breached levees, and sidecast piles. Private managers include residential and commercial owners. Local government includes cities and county. Data source: OCMP 2011a. Bass, A. L. 2010. Juvenile Coho Salmon Movement and Migration through Tide Gates. Thesis (M.S. )–Oregon State University, 2010. Brattebo, B. O., and D. B. Booth. 2003 “Long-term Stormwater Quantity and Quality Performance of Permeable Pavement Systems.” Water Research 37(18): 4369-4376. Carnefix, G., and C. Frissell. 2009. Aquatic and Other Environmental Impacts of Roads: the Case for Road Density as an Indicator of Human Disturbance and Road-Density Reduction as Restoration Target. Pacific Rivers Council Science Publication 09-001. Retrieved 9 April 2015. Exum, L. R.; Bird, S. L.; Harrison, J,; Perkins, C. A. 2005. Estimating and Projecting Impervious Cover in the Southeastern United States. U.S. Environmental Protection Agency. 133p. Forman, R. T., and L. E. Alexander. 1998. Roads and Their Major Ecological Effects. Annual review of ecology and systematics, 207-C2. Forman, R. T., and A. M. Hersperger. 1996. Road Ecology and Road Density in Different Landscapes, with International Planning and Mitigation Solutions. No. FHWA-PD-96-041. pp1-22. Giannico, G.R. and J.A. Souder. 2004. The effects of tide gates on estuarine habitats and migratory fish. Oregon Sea Grant, Oregon State University. Corvallis, OR. 9pp. Good, J. W. 2000. ‘Summary and Current Status of Oregon’s Estuarine Ecosystems’, in Oregon State of the Environment Report 2000, Oregon Progress Board, Salem, Oregon. New Hampshire Estuaries Project (NHEP). 2007. The impacts of impervious surfaces on water resources. Factsheet. University of New Hampshire. National Research Council (NRC). 2005. Assessing and Managing the Ecological Impacts of Paved Roads. Washington, D.C.: National Academies Press. Schueler, T. 2003. “Impacts of Impervious Cover on Aquatic Systems.” Center for Watershed Protection. Ellicott City, MD.